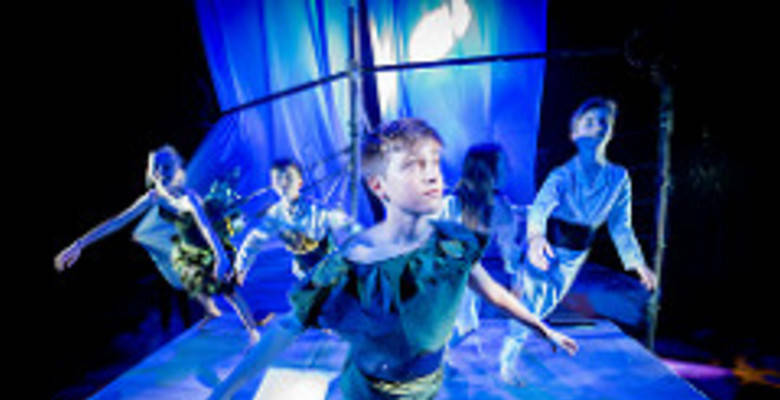 Kingston Grammar School’s latest Junior Production, Peter Pan, was a sell-out success, bringing J. M. Barrie's traditional story to life with contemporary twists and a stunning set. 33 First and Second Year students took to the stage, ably supported by a crew of 13 First to Lower Sixth students behind the scenes. The production was directed by Drama teacher Lucy Robinson. Director of Drama Sophie Boulton said: “Peter Pan quite literally never ages – it’s a great story and provides fantastic character opportunities for younger actors. I’m delighted that this production has been so well received and once again demonstrates our students’ exceptional abilities both on stage and behind the scenes." The stylised set was designed by our Theatre Manager Chris Edwards who created the various locations through creative interpretation and clever staging techniques. Puppetry was hired from the Birmingham Rep as well as being created by Theatre technician Polly Bailey, who expertly designed the wonderfully comic crocodile.The Darling children (Fin James, Ella Simon and Freddie Haynes) used ropes and swings to fly to Neverland where they met the female Captain Hook, played by Second Year Livvy Rosser, who managed a crew of compliant and cruel pirates clad in steampunk costumes and armed with pistols and swords. Their metal and lace aesthetic contrasted beautifully with the feathers and fur of the innocent Lost Boys' costumes made by KGS’s in-house costume designer, Camille Borrows.